Exhibition introduces the visitors the history of Hont from Middle Ages to 20th century ( putting stress to the middle Hont, where SAHY belongs ). Political history closes in portraits of the most famous politic and cultural persons as well as copies and original documents . Visitors can be introduced writers, scientists, politicians of middle HONT. Very interesting exhibits are cool and hand guns from the end of 19th century and beginning of 20th century. These were given to Museum in time its establishment in 1902. The people in middle and south of Hont lived in past form agricultural. To their life style remains this exhibition. It shows rooms and tools that are typical for workers households in the end of 19th century and in the first part of 20th century. Interesting are also folk costumes of Slovak and Hungarian folk. Visitors can see typical tools used in craftsman rooms, mostly tools in blacksmith's , shoemaker, carpenter, stonecutter, hat maker, wood maker and furrier. Interesting in this exhibition are gravestones form 19th and 20th century. In the 19th century the Jewish people settled down in ŠAHY. These are famous of developing economical rise in the time of chamber. This community perished during World War II. The monument for this community was set up by designer Adriana Kutaková in accordance to request of survivors. This memorial consistsof memory to ŠAHY ghetto and list of names, which died during holocaust. Text on the monument appearing in the court of museum is written in Slovak, Hungarian, English and Hebrew. Historical library: for public assets on the internet library, in the reading room of museum. Externally lending: for members of Club free. Science library: asses to internet library or public library are free. Institution was established in Šahy in 1902 as museum of chamber. Its establishment initiated constitution leaded by Elemér Ponrgácz. 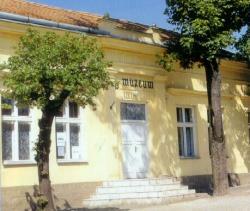 In spite of administrative changes in country the museum ended in 1924. The last keeper was Hungarian Olympian Alajos Szokolyi. Reestablishment of institution to town museum was in 1992. From 1995 is working in both buildings – on the address J. Rotaridesa 13 ( Honty Museum and on the address Pivničná 1 ( Gallery of Ľudovít Simonyi, before Honty Gallery). Institution engages in archaeological research region, organizes lectures and countries excursions. Holocaust monument on the court of Honty Museum, memorial table 100 years old Honty chamber, and Elemér Ponrgácz memorial on the frontage of Honty museum, sculpture of Adriena Kutakova called Relationships on the court of Ľudovít Simonyi Gallery.